Comfrey (Symphytum officinale) is a flowering herb, but is also classified as a weed. It spreads in clumps through an extensive root system, according to Washington State University Extension, and is hard to get rid of once it is established. Rototilling comfrey only makes the problem worse, because every fragment of root left in the ground will produce a new plant. If you want to get rid of comfrey without chemicals, it can be done with repeated attacks. Pick the day after a rain for removing comfrey from the landscape. Cultivate around the base of each plant with a spade to loosen dirt and roots. Pull upward gently and steadily from the base of the plant. Feel it start to let go, pause, then pull again, making sure you get the entire root. Repeat this process with every comfrey plant you want to remove. Cover the weeded area with pieces of cardboard or black plastic sheeting. Either one will keep air and light from reaching the soil and nourishing root fragments. Black plastic, in particular, will trap heat and "cook" any seeds waiting to germinate in the soil. Spread a 2-inch layer of mulch over the cardboard or black plastic sheeting to keep it from blowing away or shifting, and to make your landscape less unsightly. Remove the mulch, cardboard or sheeting after one year. If comfrey returns, pour boiling water over the root crown of the young plants to kill them. Common comfrey or Symphytum officinale grows to be approximately 5 feet tall. It has narrow lance-shaped leaves and usually produces bell-shaped yellow flowers that bloom from May to September, but some European variations also produce purple, red or white blossoms. Comfrey has a deep root system with thick dark-colored roots. Comfrey is a frost-resistant plant that prefers cool weather and full sunlight. It grows well in moist loamy or light sandy soil. Comfrey propagates through transplants, root cuttings and crown divisions. The plant has few serious insect or disease problems in the United States, but comfrey rust fungus damages comfrey plants in the United Kingdom. Comfrey contains chemicals that speed up wound healing. It has astringent, antifungal and antibacterial properties. 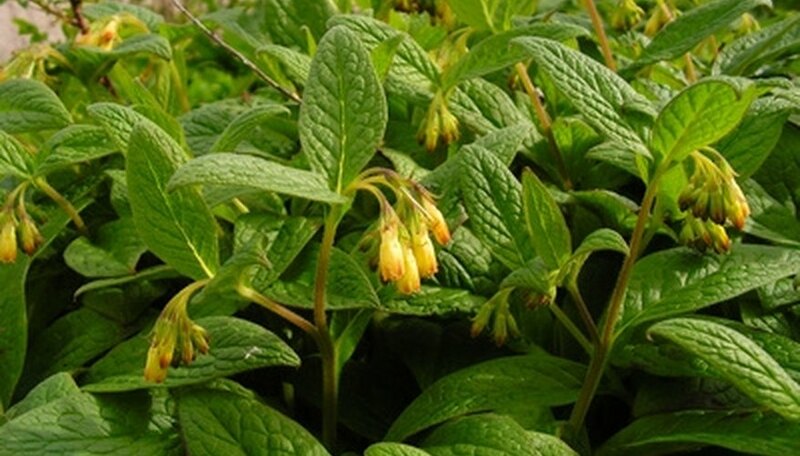 Comfrey also contains a wide variety of healthy chemicals and nutrients. Unfortunately, the herb also contains an alkaloid called pyrrolizidine that causes liver damage and cancer. The FDA banned the sale of products containing the herb in 2001. Both the fresh and dried leaves, and the fresh and dried root, star in countless folk remedies for skin problems, including wounds, bruises, burns, dermatitis and general irritation. Comfrey root contains significant traces of allantoin, which helps regenerate skin cells. The root is also rich in skin-soothing mucilage. Comfrey root tea can be taken for coughs and stomach upset. Like comfrey root, comfrey leaves contain allantoin and mucilage, though not as much mucilage as the root. Minerals and chlorophyll lacking in the root can be found in the leaves. For the more patient potion makers, herbalist Lesley Bremness suggests stuffing a dark jar with a 1-inch-square size of dried comfrey leaves, and storing them for two years. At the end of that period, the resulting oil-like liquid can be put into a small container and used for eczema and other skin conditions. While opinions vary on the advisability of consuming comfrey, folk recipes call for using the younger leaves in salads, or for cooking the leaves and stems like spinach. Few recipes for the root exist, other than as an medicinal tea. Does Amaranth Need to Be Washed Before Cooking?